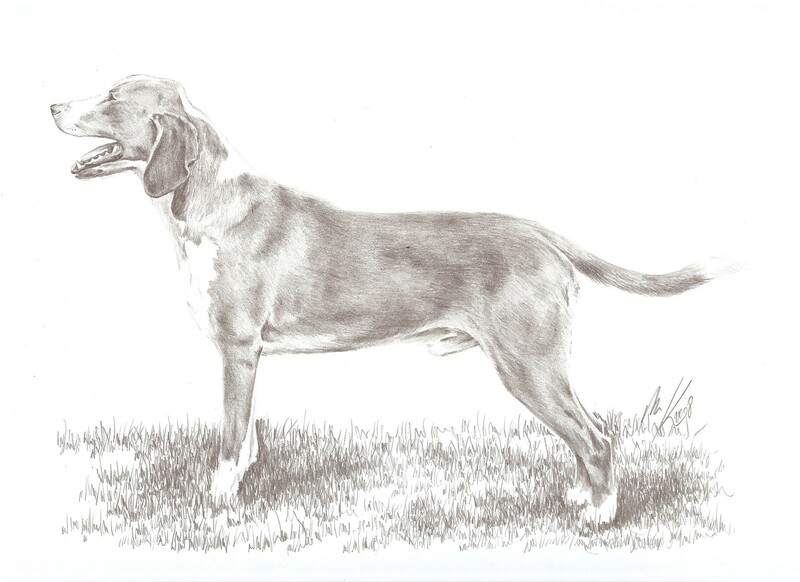 : It is a good scent hound with excellent stamina, particularly suited to hunting hare and fox. It can also be used as a leash hound. Its robust constitution is ideally suited to hunting in the vast forests and thick undergrowth in the Save valley. : This ancient hound breed is indigeneous to Croatia. Its origins are lost in the mists of time. Frescoes of 1474 (chapel dedicated to St. Mary at Beram, near Pazin), chronicles of 1719 (Bishop Bakic of Djakovo) and of 1859 (Franjo Bertic, a veterinarian, also of Djakovo) and books (Joze Kristen) all bear witness to this breed’s antiquity. These hounds from the Save Valley were sold in Croatia under the name of “boskini” and highly prized in the neighbouring regions. In 1924, the breed was presented for the first time at a dog show. The first registrations in the Croatian stud-book date back to 1929. FCI accepted the breed in 1955. The first standard bearing the correct name of the breed (Posavatz dog) was published in 1969; this name indicates that the breed originated in the broad and densely wooded Save Valley (Posavina) south-east of Zagreb. : Robust dog of average proportions whose red, reddish or wheaten coat has white markings on the head, around the neck, on the chest, on the lower limbs and at the tip of the tail. It has a high sonorous tongue. : Body length should be 11-13 % more than height at withers. : Docile, very attached to its owner, good-natured reasonably lively temperament. Very enthusiastic hunter. : Long and narrow, length 20-24 cm. : Seen in profile, frontal bone is slightly rounded. Seen from above, skull is oval and not too wide. Well-defined frontal furrow, pronounced occipital crest. : Visible but not very pronounced. : Broad, black, blackish or dark brown. : Quite long, an even width throughout its length. Nosebridge: Outline can be slightly convex. : Average thickness, tight-fitting, top lip just over-lapping bottom lip. Well-fitting commissure. Dark or black pigmentation. : Strong, regular and complete scissor bite. : Large, with perfectly fitting eyelids. Dark-coloured iris. Gentle expression. : Dropped, close-fitting to the cheeks, flat, thin, rounded at the tips. When drawn forward towards the nose they should reach the labial commissure. : See in profile chest is slightly arched. Sloping neck, of average length, well-muscled. Tight-fitting skin. : Medium length lumbar region, broad, muscled, strong and firmly attached to the croup. : Muscled, slightly rounded and moderately sloping. Hip bones hardly noticeable. : Long, broad and well let down. Well sprung ribs. Moderately broad brisket. Point of sternum not very pronounced. : Belly tucked up, flanks only just noticeable. : Continuing the line of the back, broad at the root. Average length, at most reaching the hock. Sabre tail carriage. Tail covered in thick hair like a brush, with longer hair on the under side, admissible. : Seen front on, upright; good width seen in profile slightly « propped forward ». Strong bone. : Sloping shoulder-blade, long, muscled and well attached to chest. : Neither out nor too close to the chest. : Short, very slightly sloping. : More a cat foot than a hare foot, with tight toes. Resistant elastic pads. Strong nails, preferably dark. : Seen in profile slightly « propped back ». : Medium length, broad, muscled. : Sloping, longer than thigh. : Upright, medium length, any dewclaws should be removed. : Even, flowing, reasonably lively. : Elastic, well-fitting over all the body, no wrinkles. : 2-3 cm long, straight, dense and close-lying. Belly well covered with hair. The hair is slightly longer on the underside of the belly, on the back of the limbs and on the underside of the tail. : Colour can be all shades of reddish wheaten but never brown or chocolate. White markings on the head can be a star, a blaze or a more wide-spread white mark. On the neck, white markings either form a collar or a splash on the throat; white markings are also found on the chest, under the belly, on the underpart of limbs and on the end of the tail. In all these designated areas, white markings are sought after but must never cover more than one third of the whole body. Ideal height for males 50 cm, for females 48 cm. Pale pigmentation on nose, eyerims and lips.